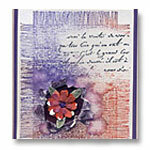 Mothers Day Cards created specially for your mother will surely bring gladness to her heart. It is so much more meaningful and endearing to handmade it for the special person who brought us into the world. Mothers hold their child's hand for a moment and their heart for a lifetime. I hope that these examples will inspire you to make your own mother's day card for that so important woman in your life. Remember that mother's day comes only once a year. So why not take this opportunity to tell your mom how much you love her and what she meant to you. 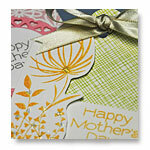 Below are some examples of Happy Mothers Day cards you can easily make. Mother's Day card using Spellbinders Die - Fancy Tags Three and Bo Bunny's patterned paper. A very simple card to make and can use this cardmaking design and idea to make a batch for your Happy Mother's church event or other big celebration. Have a look! Have you any idea how you can make it special for that very important woman in your life? Honor Mom with these beautiful cards. Mothers Day tags are so useful for labeling your gifts for moms. They can be exquisite or they can also sport a grunge look. Since they are handmade by you yourself, you know what kind of gift you are giving and what style mama favors. So let's make these little beauties and attach them to your Happy Mother's Day presents. 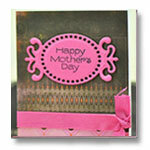 A simple Mothers day card using We R Memory Keeper's Sew Easy piercing tools and scrapbook bling embellishments. 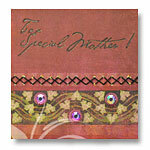 Some patience needed to make this card because you will be stitching on paper. Other than the stitching which is the most difficult part, the rest of this Mother's Day card is just a breeze to make. 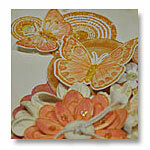 This is a rather more elaborate handmade card with some layering, die cuts and stamped images as well as embellishments. You need to be patient when making this card. Study the bigger image provided and then get ready all needed cardmaking supplies before attempting this handmade greeting card. 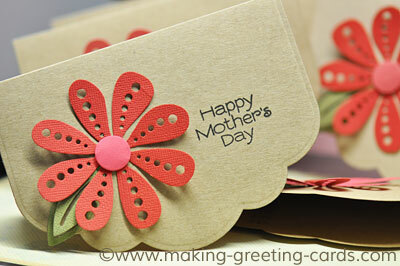 Here's a very easy-to-make mother's day card that you can make quickly. Do not think that quick and simple isn't nice enough. It can be as beautiful as the napkin you use to make this card. Try it if you do not have enough time to make a more elaborate card. Giving flowers to mom for Mothers Day? Here's a card that you can make to go with the flowers. 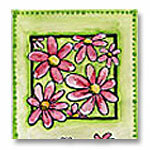 This mothers day card uses bright colors that will certainly brighten any mother's heart. A red heart for a super mom! 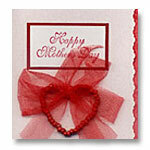 This mothers day greeting card uses striking red beads formed into a heart. The red color netted ribbon soften the whole look and gives this look that happy occasion effect. Making interesting mothers day cards can be fun. 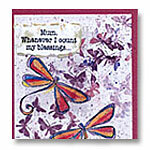 This is a card I made for my mom using dragonfly image rubber stamp and torn paper with computer printed message. The message said,"Mum, whenever I count my blessings, I count you twice." Rubber stamps used are Dragonflies by Magenta Rubber Stamps and Splatter Pattern background by All Night Media Rubber Stamp. 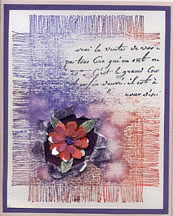 click here to view a bigger image of this card. 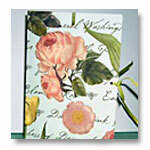 The above card design can also be used for Mothers Day Greeting Cards. It's created using rubber stamp by Hero Arts Rubber Stamp and background stamp by All Night Media Rubber Stamp. The flower is from a floral paper punch.